The Nova Scotia Museum's Mi'kmaq Portraits Collection is a database of more than 700 portraits and illustrations that provides a glimpse into the history of the Mi'kmaq of Atlantic Canada. The collection results from research by the Museum over many years, often with the participation of Mi'kmaq individuals and other institutions. 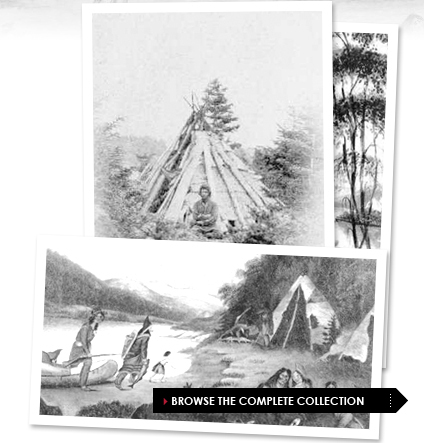 While the collection does not list all of the historical Mi'kmaq portraits still in existence, it is a beginning and is a tool for educators and students to learn about Mi'kmaq heritage, while offering researchers access to a comprehensive collection of images. Thousands of years before the arrival of European settlers, the Mi'kmaq called themselves L'nu'k, which simply means 'the people,' 'human beings.' Their present name, Mi'kmaq, derives from nikmaq, meaning 'my kin-friends.' Their descendants are still living in the area now known as the Atlantic Provinces and the Southern Gaspe Bay Peninsula. This area is known to Mi'kmaw people as Mi'kma'ki. Many also make their homes in New England, particularly in Maine and Massachusetts.